Lead exposure in Maryland and Virginia remains a serious problem that can cause the diminishment of IQ levels, as well as neurobehavioral issues such as attention deficit disorder, reduced hearing acuity and adverse effects on the cardiovascular, renal and immune systems. Moreover, fetuses, infants and children are more susceptible to lead exposure than adults because lead is more easily absorbed into their bodies, and their tissues are more vulnerable to the damaging effects of lead. Lead poisoning remains a critical issue in Baltimore. Despite efforts to address the urgent health issue of lead poisoning, as many as one in six children in certain Baltimore neighborhoods still enter school with elevated blood lead levels. Chesapeake PSR advocates for improved monitoring, reporting and intervention programs for lead poisoning in Maryland and Virginia. We support state and local efforts to reduce lead poisoning and help facilitate efforts by health groups, housing advocates and environmental organizations to develop legislative and policy agendas that lead to reduced lead exposure in children. In 2018, Chesapeake PSR will focus on passing Maryland statewide legislation to require environmental investigations and interventions to be conducted when children have elevated blood levels greater than 5 micrograms per deciliter. The U.S. Centers for Disease Control and Prevention (CDC) recommend that lower threshold than Maryland law, which sets it at 10 micrograms per deciliter. Please sign our health professional sign-on letter, "Health Professionals Urge Maryland's Legislature to Strengthen Responses to Lead Exposures in Children." The following outlines some of the work we are doing on this important issue in Maryland. We are currently exploring areas where we can work on lead poising issues in Virginia. 2016: Our updated map showing the difference in blood lead levels in suburban Maryland counties and Baltimore in 2016. See the 2015 map below to compare changes since we made our last map. Census-level charts here. 2015: This chart was developed by Chesapeake PSR using data from the Maryland Department of the Environment (MDE). 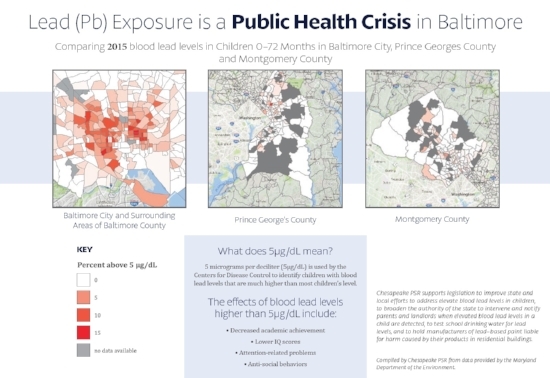 It shows the severity of lead poisoning in children in Baltimore neighborhoods, and compares it to the smaller poisoning levels in Montgomery and Prince George’s counties. Chesapeake PSR made another map, which you can obtain by clicking here, that shows the Baltimore neighborhoods with the highest levels of lead poisoning. In 2016, Chesapeake PSR held two workshops in conjunction with MedChi, The Maryland State Medical Society, for health professionals and advocates to develop a common advocacy agenda to end lead poisoning in Maryland. Dr. Cliff Mitchell of the Department of Health and Mental Hygiene, at left, updates participants on the state's new testing requirements. Read presentations from the two workshops by clicking here. Chesapeake PSR also advocates for better monitoring and reporting of lead air emissions in the Baltimore area. A review of federal and state air emissions reports by Chesapeake PSR in 2015 found significant problems in the way the Maryland Department of the Environment (MDE) monitors, collects, and reports information on lead air emissions from industrial facilities. Chesapeake PSR also sent a letter in 2016 to MDE Secretary Ben Grumbles asking for a moratorium on new lead-emitting facilities in Southern Baltimore, including Curtis Bay. We also wrote to 12 entities asking that they not purchase energy from a proposed incinerator in Curtis Bay that was permitted to emit 1,000 pounds of lead per year. Our letter to Baltimore City is here. Read about Chesapeake PSR's positions on state lead legislation here. Contact our executive director, Tim Whitehouse, at twhitehouse@psr.org, to see how you can become involved in working on lead issues in Maryland and Virginia.